Some of the things that surface from the vortex of ancient ephemera that is my office shock me. 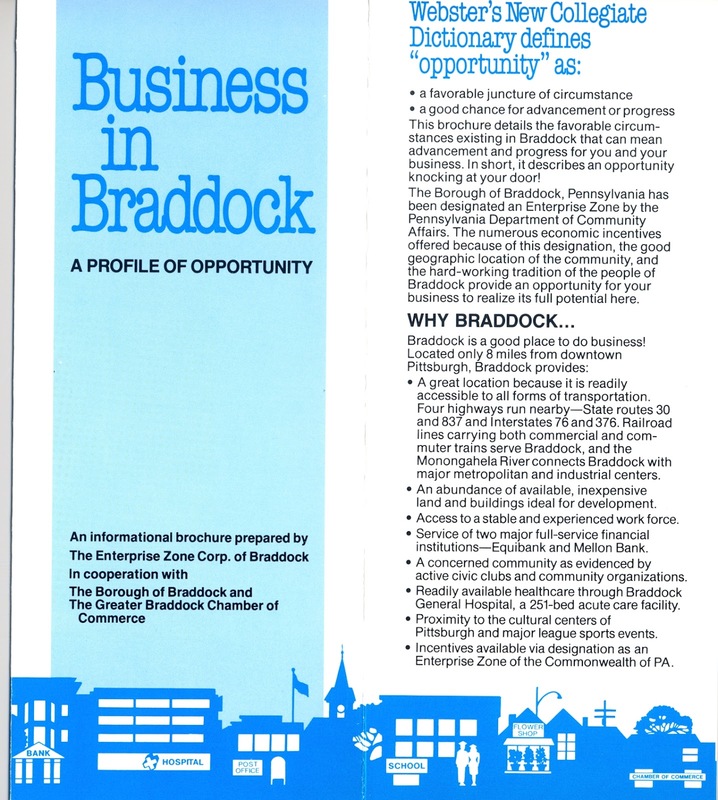 If you click on the images for higher resolution versions, you can read the following brochure more clearly. 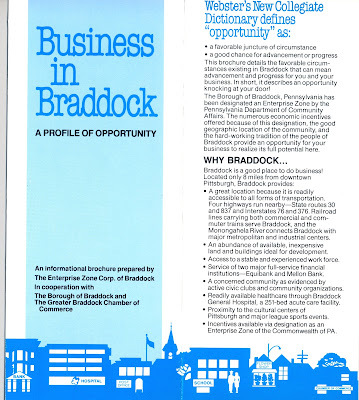 I just don't have it in me to parse the paragraph under "WHY BRADDOCK....". Things surely sounded like everything was looking up when this was printed. You'll find a more in-depth description of the index and its variables here<http://www.clevelandfed.org/Community_Development/publications/CSI/201106/index.cfm?DCS.nav=Local>. 1. 90 Days or More Delinquency Index: The region's delinquency rate has declined from its peak of 3.7% in January 2010 to 2.8%. This delinquency rate remains below the state average of 3.1%. The highest rates are in Fayette County (Dunbar and Franklin Townships) and inner-ring suburbs east of Pittsburgh (Penn Hills Township and McKeesport), while the lowest rates are in eastern Allegheny County and southern Butler County. Compared to January 2012 the largest increases occurred in several communities east of Pittsburgh (Duquesne and North Braddock) and the largest decreases have occurred in several communities in Fayette County and northeast Butler County. 2. Foreclosure Index: The region's foreclosure rate, like its delinquencyrate, has also declined from its peak of 2.9% in August 2012 to the current rate of2.4%. This also remains significantly lower than the state average of 3.3%. The highest rates are seen in several communities in eastern Westmoreland County and northern Armstrong County, while the lowest rates are in western Allegheny County and southern Butler County. Compared to January 2012, a number of zip codes are seeing slight increases in their foreclosure rates, but close to 80% of the region's zip codes remain below the statewide foreclosure rate. 3. REO Index: Only ten 10 zip codes contain REO rates greater than 2%. Compared to January 2012, almost 20% of the region's zip codes saw an increase in their REO rates. However, most of the changes were less than 0.60 percentage points. 4. Home Value Change Index: From 2005 to 2012, only 5% of the zip codes with reported data saw a decline in home value. The trends are more volatile whencomparing 2011 to 2012, as roughly equal numbers of zip codes showed increases in home values as showed decreases. 5. Originations to Shadow Inventory Index (SI): According to this indicator, a zip code with more mortgage originations per distressed units indicates a sign of recovery. This ratio is highest in communities in western Allegheny and southern Butler counties, and lowest in northeastern Armstrong County. 6. Credit Delinquency Index: The highest credit delinquency rates are in Pittsburgh's eastern inner-ring suburbs and northern Westmoreland County, while the lowest are in communities north and southwest of Pittsburgh. No clear pattern is discernible when comparing rates to January 2012. 7. Community Stabilization Index: Overall, the region's delinquency and foreclosure rates are below the state averages and many communities are seeing stable or rising home values; this bodes well for the region's future. That being said, there are still several communities in Fayette and Armstrong counties, as well as just east of Pittsburgh, that face high levels of distress. So everyone is agog over some new reports. PG: Two surveys rank Pittsburgh among "smartest populations" in country, Trib:Pittsburgh’s smart; survey says so. Some of the original work generating this all is via Rich Florida. Atlantic: Are these America's Brainiest Cities. None of it should not be any surprise to readers here. 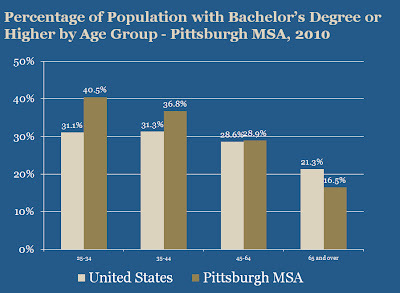 The lack of belief in how we compared to the nation with regards to educational attainment is why I once wrote this: Pittsburgh's Young Workforce Among Top 5 Most Educated in U.S.; Almost Half Hold a Bachelor's Degree or Higher. When the focus was narrowed to graduate degrees, Pittsburgh tied for the top with Washington,DC in that past calculation of educational attainment in the local labor force. But the real importance is what it means to individuals. Hard to get past the difference in lifetime earning potential of a college degree, though I know many dispute the value given the cost. Here is just a recent snapshot of the earnings disparities by both educational attainment and gender. That chart actually understates the value of advanced education. By definition these are earnings of those who have jobs. What most overlook is that degrees give a lifetime of flexibility that decreases the unemployment rate for those with advanced degrees. The unemployment rate for those with a bachelors degree is well below even those with an associate's degree, and even lower for graduate education. (ref) When you factor that in, the difference in earnings between those with higher education and those without is even greater. City Council still working on North Side issues. Trib: Pittsburgh council floats compromise to preserve Mexican War Streets. 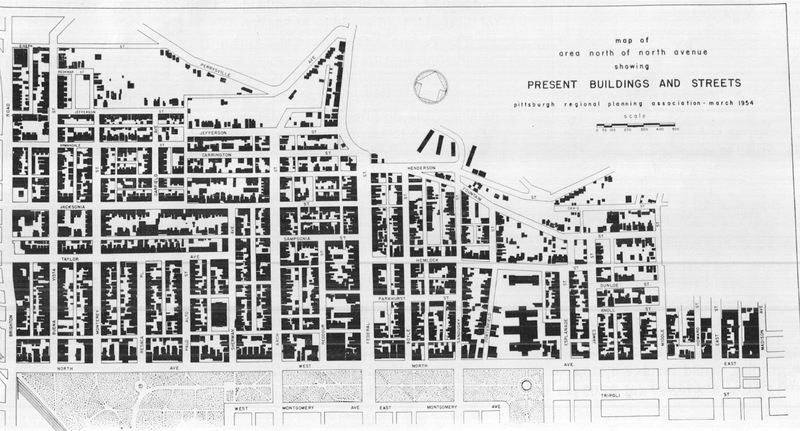 PG: Bill defeated to extend Mexican War Streets historic district. Part of me is just amazed how some debates here go on not just for years, but generations. What to do with North Side real estate was a big top early in the 1950s. I'll repost again some great old images of what was once envisioned for the Mexican War Streets neighborhood on the North Side. Again, these are some images from the North Side Study of 1954. The question that asks itself is... if this had been built, when would it all have been torn down, and what debates would we be having today? Also from a post last week, the contemporaneous news coverage of the plan below. The powers that be were sure that "This would do it"
Those just have to be local actors. Where are they now? No mention at all of reassessment impacts in the story today about expanding investment precisely in the Downtown commercial real estate market that was said to be, actually was, hit hardest by the reassessment? Maybe it didn't happen? Read the old story. 'Panic' was used in a quote to describe the investment climate Downtown. Really funny thing is that I bet a lot of the real estate deals in today's story were well in progress when the earlier story was written. Could it be that investors were waiting for the reassessment to be completed? Business abhors political uncertainty. Just a hypothesis I have had for a long time, but the decade long delay in completing the reassessment just could not have been a good thing for real estate values. The market knew full well the reassessment was going to be completed (rational expectations anyone? ), it just wanted the assessment completed so investors could plan for future tax rates. Think I am just making that up? Here is just one past perspective from the real estate community when the political angst over reassessments was near its peak: Pittsburgh Exemplifies Pennsylvania’s Property Tax Discord. The professionals were not complaining that reassessments needed to be completed, as they are routinely in virtually every other major city/county in the nation. It was the uncertainty of it all that was the worst. Pols tried to kill off the entire assessment process all the way to the end, by most any means possible. Imagine if they had succeeded? Would all this new investment be happening? The timing is striking if nothing else, stories on new investment coming right as the new assessement values are kicking in. For sure, correlation does not imply causality, but folks continually repeated that the new reassessment was going to choke off all investment in the local real estate market for years to come. I think we have proven at the very least that the market can deal with it all, probably a lot better than the politics can. and let's not even get into how the new assessments have slowed down investment/appreciation in the neighborhoods which had the biggest assessment increases. Funny that. 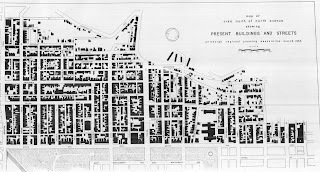 I read at The Original History of Pittsburgh that the Pittsburgh mystery protractor map being updated. Reminds me we really ought to get back to that Isalys map. Someday. Just some numbers to ponder. Here is what I get for the latest data on transit usage here and up the turnpike in Cleveland. I'm a little unclear the image selection at time 0.45 there. Use PAT to get to the scene of a fire? Opens with the best image ever to go with slogan "My other car is a bus"... long before that ever became a bumper sticker I bet. And the image at time 0:12 is just a bit beyond description. Which begs a really really important question. When did 'North Side' become two words? A modernism? We need to start a crusade for the proper use of Pittsburghese. Maybe an office like they have in the Vatican making up new latin words as needed. and the greatest thing is them munching on onion rings at the end. We really need to come up with an award for this type of thing. Call it The Isalys or something. and yes, that is all filmed in Ritters late one night. Despite some beliefs to the contrary, the Pittsburgh School District's property tax rate is not high relative to many other districts in Allegheny county. (13.92 mills) In fact one of the city’s immediate neighbors, the Wilkinsburg SD , has one of the highest property tax rate sin the state (school district: 36.67 mills). Yes, I know there is a higher income tax rate, but hold that thought for just a minute. Now go read a story I meant to get back to is this in PG (May 31) : Ferlo hosts talks on 'unsustainable' Wilkinsburg education. Read the reaction Sen Ferlo got when he merely suggested the possibility that it is worth thinking about the Wilkinsburg school district being merged into the Pittsburgh School District. This is to a crowd in Wilkinsburg, not the city of Pittsburgh. They don’t like the idea and it took a bit of political courage to even float the thought. It's a lot more painful than crazy bloggers suggesting such things. I suspect he knew the response he would get. What I wonder about is whether anyone has pointed out just how much $$ the residents of Wilkinsburg would save if indeed they merged the municipality with the city of Pittsburgh. You might think that the prospect of lowering property tax rates by over 62% would at the very least not be frowned upon. How much $$ does this really work out to? So using the market valuation that correlates to those millage rates… Wilkinsburg has approximately $358 million in taxable property value. Going from 36.67 to 13.92 mills would save Wilkinsburg residents a fair bit. Potentially as high as $8 million annually (36.67 - 13.92) mills * $358 million. To complete the calculation you at least need to add the additional income tax you get hit with as a city of Pittsburgh resident. Wilkinsburg SD collects a 0.5% earned income tax, while the Pittsburgh SD collects 2%. If Wilkinsburg collects on the order of 870K in earned income tax now (on par with that the borough of Wilkinsburg gets from its own 0.5% income tax), it would go up by roughly $2.6 million to approx. $3.5 million. Still seems like a good financial deal. The benefits go beyond the first order calculations of course. You just have to believe the high property tax rate is pushing down investment and keeping real estate values low. Might real estate values jump quickly if property tax rates dropped so much? Could be quite an equity windfall being passed up as well. What it all gets to is just how much people don’t like any hint of school district consolidation. Folks are clearly willing to vote with their pocketbooks and pay the price of staying separate. Thus whenever you see the argument that regionalism leads to efficiency, it may be true, but equally discounted by many voters out there. You need to go beyond the financial if you want to make the case for anything like this. Conflagration on the North Side over a proposed expansion of the historic district there. Might be worth looking again at what was once planned for the area. Would have made for a different neighborhood history for sure if more than the 279 spur ever came to pass. Then there is this whole ring-gate thing. Serves Kraft right for getting out of Frequency-Gate if you ask me. Curious, though, how this new tempest makes more news than a little issue with a piece of paper and the same principal. Check out the photo caption in this out of Ohio: Ohio leaders focus on ‘selling our state’ to keep, lure the young and educated. Emergency, emergency, call Border Guard Bob! and I am a bit biased, but still the coolest story of the week. Otherwise titled the Ruptured Duck returneth. Worth a read and coming from right in the center of Cleveburgh. "...example of the money that has flowed into the state's industrial sector in recent years thanks to the surge in U.S. natural gas and oil drilling." "But state employment data, academic research and a week-long tour of half a dozen factories in Ohio suggests the shale gas revolution has been a disappointment when it comes to job creation. " Locally there is a lot of similar confusion. Many I talk to, some including the more informed folks I know, are pretty convinced local manufacturing job numbers are shooting up in recent years because of shale related investments and demand. Probably because of some advertisments I see perpeturally running on TV. Anyone want to back that up with something resembling data? In March, a study by Cleveland State University concluded that while gas exploration had unleashed a surge in economic activity in Ohio, job growth - even in counties directly affected by the drilling - was stagnant. The employment growth that many assumed would follow the energy investment was "not yet evident," the study's authors said. Where is the Wiz by the way? Maybe his (or her) contract expired? It really is impossible, and I certainly don't have the space here, to explain the significance of these two seemingly unconnected stories over the last 24 hours. Both articles are incredibly understated given their importance. I could tell the story of Pittsburgh's recent economic history using nothing more than those two stories as a foil. For some other day, or venue. Yes, there is a quote from me today in the Trib: Census: Allegheny County youngest population grows. The short story here is that are seeing demographic impacts from the sustained turnaround in net migration into the region. Now going on at least our 5th year of positive net migration. There is a longer term story here of course. From, frighteningly, 13 years ago is this oped: We're getting younger every year. I take responsibility for the title, though I think it would have been better phrased that everyone is getting older faster than we are. So the story continues today. Governing is just out with a story and data on aging by state.New Census Estimates Show Areas Growing Oldest the Fastest. In their table you will see that Pennsylvania's elderly population increase is one of the slowest growth rates in the nation. Between 2010-2012, our elderly population increase by 0.5%. States such as Colorado, Utah, Texas, and North Dakota all had increase over 3%. It is going to be an ongoing trend well into the future. The news today is just based on some new county level data put out by the census. There is no update for municipal level demographics. Nonetheless, the story is really a corollary to the trends that have been going on in the city for going on two decades now, even though I know many think this is a new story. If only Ben Franklin actually said either one, it might mean what some want it to mean. Since Ben was a couple centuries ahead of digital cryptology, let alone cell phones, you just know it has a less than straighforward application to contemporary events. To crib from a couple sources I refer you to Benjamin Wittes writing at the Brookings Institution today: Against a Crude Balance: Platform Security and the Hostile Symbiosis Between Liberty and Security. He references an earlier work: Would Ben Franklin Trade Liberty for Wiretapping? Close enough for government work. But does it mean what everyone thinks it does? The deeper perversion is missing the entire original intent of the quote. Read the Wilkes pieces linked above for the full story, but in short Franklin was arguing for HIS freedom as a legislator in the Pennsylvania assembly to RAISE taxes in order to spend MORE on the Commonwealth's military budget. Just a bit different from the quote's new reworked afterlife. The obligatory Pittsburgh connection? Why did Franklin think more defense spending was needed? Because of a growing threat on the Pennsylvania frontier. That frontier circa 1750 was that which would soon be named Pittsburgh and environs. Of note it was a debatable point in the longitude challenged era whether the forks of the Ohio River rested within the claims of William Penn, or that of the Commonwealth of Virginia. Franklin might have been anticipating a need to defend the region against the Virginia Colonial Militia which was soon to send a young Lieutenant Colonel on a mission there. An irony of sorts is that the next time military spending was increased to send military forces into Western Pennsylvania along abouts 1791, the enemy was us. The lesson? Just say no to paraphrasing. If you watch just one D-Day memorial out there, please watch the video of 91 year old Henry Parham on the PG Website. Remarkable for so many reasons, but demographics being what they are, there can't be more than 200 Black men over the age of 91 in Allegheny County these days. So just being able to make that interview is a feat unto itself. The President of the United States of America takes pride in presenting the Navy Cross (Posthumously) to Lieutenant Arthur Vincent Ely (NSN: 0-75039), United States Navy, for extraordinary heroism in operations against the enemy while serving as Pilot of a carrier-based Navy Torpedo Plane and Executive Officer of Torpedo Squadron SIX (VT-6), attached to the U.S.S. ENTERPRISE (CV-6), during the "Air Battle of Midway," against enemy Japanese forces on 4 June 1942. Participating in a vigorous and intensive assault against the Japanese invasion fleet, Lieutenant Ely pressed home his attack with relentless determination in the face of a terrific barrage of anti-aircraft fire. The unprecedented conditions under which his squadron launched its offensive were so exceptional that it is highly improbably the occasion may ever recur where other pilots of the service will be called upon to demonstrate an equal degree of gallantry and fortitude. His extreme disregard of personal safety contributed materially to the success of our forces and his loyal conduct was in keeping with the highest traditions of the United States Naval Service. He gallantly gave his life for his country. I'd love to hear the conversation where the assignment editor says to go cover the story of the giant duck. The what? So this is the same story from a few years ago really, (or an earlier reference fyi) but a new release of data from the Census folks calculates the "daytime" populations of most municipalities. See: Commuter-Adjusted Population Estimates: American Community Survey 2006-2010. So for Pittsburgh, the latest estimate of the city's daytime population is calculated to be 457,049 or more than 48% above the resident (or presumably nighttime) population. The report is really just looking at flows of commuters to work, and not other potential reasons the daytime population is likely higher than the resident population. 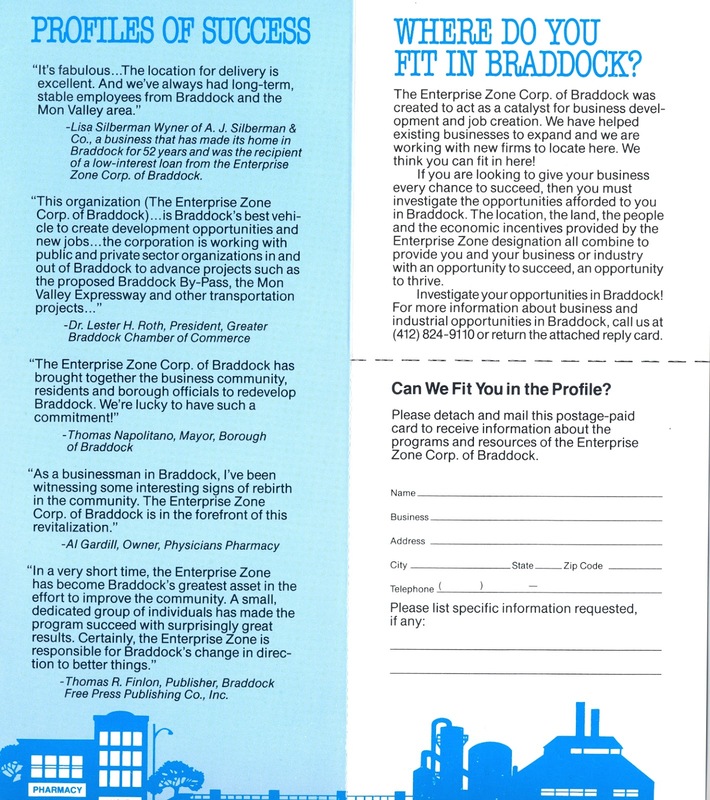 Add in the number of folks coming into the city for school, shopping, business or for most any service including inpatient and outpatient hospital services, and for sure the 'daytime' population for the city of Pittsburgh is much higher. I'm pretty sure that if we took the time to add up some of those other factors we can get over the 500K number I think people like to quote... or make up depending. Actually what is worth noting is the trend. The first link there is from a 2006 story which looked back on older data which calculated Pittsburgh's 'daytime' surge to be +41%. So we are not getting an estimated +48% surge likely reflecting the decline in population over the decade coupled with the stability in the number of jobs. Pittsburgh's high ranking is a function of our fragmentation locally and how small the city of Pittsburgh is within the labor shed. Also the remarkable number of jobs that have remained concentrated within the center city. Again as I've mentioned before: The City of Pittsburgh has a nearly identical number of jobs located within the city proper as it did over a half century ago if not further in the past. So population decline for sure, but whenever anyone says the number of 'jobs' in the city has gone down in either the long term or even the short term, ask them what they are referencing. When you consider the population was a lot bigger back then it must be that that a big chunk of those jobs were retail and service sector jobs directly tied to the resident population. 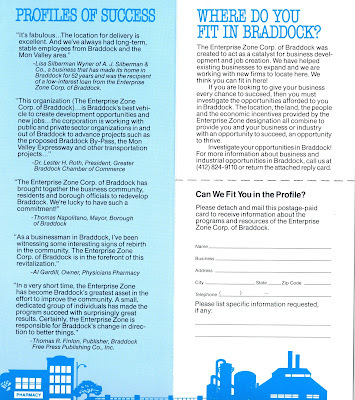 For the job count to have remained the same, despite the big loss in resident population, there must have been significant growth in jobs that provide goods or services to the world outside of Pittsburgh.